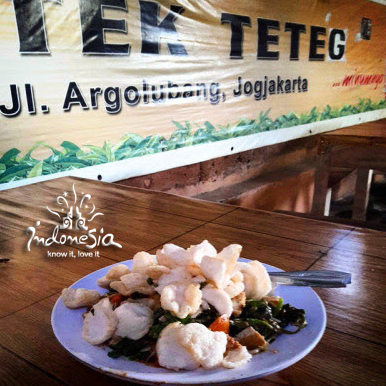 IndonesiaTravelVisit.com | Lotek and gado-gado which became Indonesian popular dishes are served with large portions in Warung Lotek Teteg. Besides its special taste, its strategic location, its shady place also make this food stall always be visited by the food lovers. Lotek and gado-gado which are usually called as Indonesian salad become the main menu in Warung Lotek Teteg. This food stall which is located several meters in the east of Lempuyangan Station is crowded by the visitors when IndonesiaTravelVisit.com go there. Its place are comfortable, shady, and wide. The place to eat is divided into two, lesehan (no seat) and using seat. Entering this restaurant, familiar ambiance suddenly be felt. A singer is singing traditional song and makes own comfortable feeling. Not only lotek and gado-gado but also variant of juice we can get here. No need much time after IndonesiaTravelVisit.com orders, the waiter brings two plates of lotek and gado-gado. The first impression when we see those lotek and gado-gado, of course is shocked and confused because the portions are much. 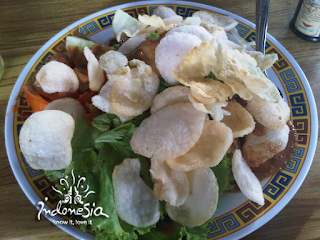 Then arise a question, can IndonesiaTravelVisit.com eat it all? When a spoonful of lotek enters our mouth, peanut sauce immediately felt on the tongue. The flavors are perfectly absorbed between the spinach and chickpeas that become the filling of lotek. Its chips are really crispy so it makes sound kriuk kriuk, very fit with its nut sauce. Likewise for its gado-gado. Thick peanut sauce melts together with fresh vegetables which become the filling of this gado-gado. Finally, a large portion of it is finished. Really really wareg (Javanese word for full)! 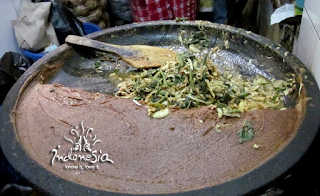 Visiting the kitchen, IndonesiaTravelVisit.com sees a big mortar with 80 centimeters diameter. It is bigger than the size of standard mortar. Besides its large portion, the big mortar also becomes Lotek Teteg's characteristic. According to Bu Nur, the second generation of this restaurant owner, that mortar was used to make peanut flavors since long time ago. This big mortar can make peanut sauce for 80 portions in the morning. If the visitors are many, Bu Nur will not be bothered to make the peanut sauce again. The idea to use this big mortar came from Mr. Untung, the founder of this restaurant and also Bu Nur's father. This big mortar is used to make more practice and it will not eliminate the taste of peanut sauce. That's what makes the peanut sauce is very special in this stall, it looks soupy and tasted different from others lotek. Well, Lotek Teteg itself had stood since 1968. Formerly this lotek restaurant named "Sederhana". It is because the place is near to teteg (fence) railroad, the customer called is as Warung Lotek Teteg. 0 Komentar untuk "LOTEK TETEG , A Large Portions of Lotek and Gado-Gado"